Fungi are a taxonomic kingdom of eukaryotic organisms, the most familiar of which are mushrooms, yeast, mold, and mildew. Thousands of different types of fungi exist on Earth. They can be found in air, in soil, on plants, and in water. Some live in the human body, usually without causing illness. All fungi are multicellular with the exception of yeast. (Miller, p 527) Their cells are made up of thin, stringy filaments known as hyphae. Hyphae have many nuclei, and some have cross walls called septa that separate each cell. A mass of hyphae is the main body of the fungus, known as the mycelium. The mycelium is well adapted for taking many nutrients because it has a large surface area. (Miller, p 528) The mycelium is usually underground, hidden in a food source or soil. A zygomycete's hyphae decomposing a fruit. Gills of a mushroom containing basidia. Parasitic fungus infection called onychomycosis. Fungi are also very important to normal human activities. For example, yeasts are used to make breads, beer, and wine. Vats of fungi are grown to create enzymes to remove stains, produce flavorings for cooking, and even vitamins. Many edible mushrooms are favorite delicacies, and some are extremely rare. Morels and truffles are two valuable and delicious mushrooms that are hunted because of their remarkable taste. In fact, truffles in particuluar are so difficult to find that a pound of them can cost hundreds of dollars. Some fungi, such as Penicillium notatum, are used to make antibiotics. The drug penicillin kills off bacteria and germs, saving many people from death due to bacterial diseases. Other fungi, especially yeasts, are ideal model organisms for molecular biology and genetics. In China, a parasitic fungus that attacks caterpillars has been used as a medicine for centuries. It is used as a strength restorative and tonic. Controlling moth populations that harm farmland is also a possible use for this fungus. Some types of fungi are also used to make drugs that keep the body from rejecting organ transplants. 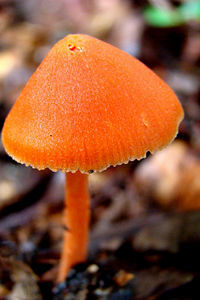 Fungi are used as biocontrols, replacing expensive and harmful pesticides. Biocontrol utilizes a specific organism to kill off another one. The fungi that are used are usually parasitic, especially for insects such as ants, spittlebugs, and potato beetles. Some fungi are even used to control other fungi that harm plant roots or cause disease. Fungi can cause of number of diseases which are collectively called mycoses. Mycoses can affect your skin, nails, body hair, internal organs such as your lungs, and body systems such as your nervous system. Aspergillus fumigatus, for example, can cause aspergillosis, a fungal infection in your respiratory system. Fungi can cause diseases of plants as well. Scientists who work with wheat are concerned about new kinds of a fungus called rust, which attacks wheat plants. The fungi from the genus Puccinia, called stem rust and yellow rust, have started to even infect wheat that has a genetic resistance to these fungi. Biologists are working to find strains of wheat that will resist these new wheat pathogens. Two redwood seedlings; the one on the right was grown with mycorrhizae, but the left one was grown without it. ↑ 1.0 1.1 Fungi: More on Morphology by Ben Waggoner. UCMP (University of California and Museum of Paleontology). ↑ 2.0 2.1 2.2 Fungi- The Hidden Kingdom by Robert Fogel. Fun Facts About Fungi. 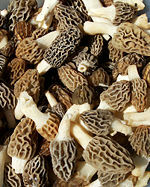 ↑ Morels: Pitted Delights by Robert Fogel. Fun Facts About Fungi. ↑ Truffles: Gold in the Soil by Robert Fogel. Fun Facts About Fungi. ↑ Penicillin: The First Miracle Drug by Robert Fogel. Fun Facts About Fungi. ↑ Introduction of the Fungi by Ben Waggoner. UCMP (University of California and Museum of Paleontology). ↑ Caterpillar Fungus: A Traditional Medicine by Lai Ming (Vivian) Luk. Fun Facts About Fungi. ↑ Fungal Terminators: Biocontrol by Robert Fogel. Fun Facts About Fungi. ↑ Rust Never Sleeps A new flare-up in an age-old battle between wheat and a fungal killer, By Rachel Ehrenberg, Science News, September 25th, 2010; Vol.178 #7 (p. 22). Accessed September 15, 2010. Fungi by Meredith Blackwell et al. Tree of Life Web Project. Miller, Levine. Prentice Hall Biology. 2008. Chapter 21: Fungi (pg 526-547). This page was last modified on 20 June 2016, at 00:22.